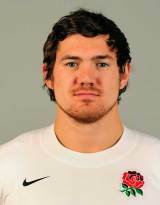 Alex Goode is equally adept at fullback and fly-half but is usually used at the back of the field at Saracens. Goode was an all rounder as a younger man and played county tennis, reached the National Schools athletics finals and played football for the Ipswich FC academy. But he opted to turn his attentions to rugby. Highly rated by coach Brendan Venter when he was in charge of Saracens, Goode impressed as the club switched to a free running style in the second half of the 2009-10 season. Goode played a pivotal role as Saracens reached the Aviva Premiership Grand Final, where they beat Leicester Tigers. Despite his fine form, Goode was overlooked for England's squad for the World Cup in New Zealand. Goode once again shone throughout the 2011-12 campaign playing at both fly-half and fullback and it was his versatility which helped propel him into the England reckoning after he was included in their 42-man squad for the tour to South Africa. He made his debut as a replacement in the second Test and impressed sufficiently to be handed a first start in the final Test of the series. Goode was solid under the high ball at fullback but had stern competition for a place in the side going forward in the guise of both Ben Foden and Mike Brown. However with Foden injured and Brown thrust onto the wing, Goode was given the No.15 shirt for the autumn internationals and excelled to the extent that he continued in the role for England's subsequent Six Nations campaign.